Ever since I was little I have had an aversion to dairy milk. This avoidance has lead me to discover my preference for nut-based milks and products. While I have not found one I do not particularly like, my longstanding favorite is almond milk, with my more recent favorite, cashew milk. For years I have been drinking almond milk as a dairy alternative and substituting it as an ingredient whenever a recipe calls for milk. It was not until recently recently that I've started making my own, and I must say I am glad I made the switch. There really is nothing comparable to homemade almond milk. It's light and refreshing with hints of a sweet nuttiness. Now don't be intimidated. Homemade almond milk (or any nut milk for that matter) is surprisingly easy to make. It simply consists of soaking, blending and straining. Once you've taste fresh, ice cold homemade almond milk you may never purchase store-bought almond milk again. Almond milk is a great dairy-free alternative to cow's milk. It is easy to digest, can reduce bloating, and therefore an alternative for those who lactose intolerant or sensitive to dairy. Almond milk has less calories (roughly 60 kcal per 1 cup compared to 80 kcal per 1 cup of skim milk) and carbohydrates (1 g of carbs compared to 12 g of carbs in cow's milk) than cow's milk. Almond milk also contains heart-healthy poly- and monounsaturated fats and is also free from saturated fat, trans fats and dietary cholesterol, unlike cow's milk. While almond milk is a good source of nutrients, it is not a good source of protein and calcium, as is cow's milk. But don't let that stop you! There are plenty of plant-base protein and calcium sources that can supply you with adequate amount of protein in your diet. Check out this post from Daiya Foods on good sources of non-diry calcium. Also, if you have questions about how much protein you need or want to know if you are getting enough, contact me for a one-on-one consult! Homemade almond milk is as as easy as one, two, three — soak, blend, strain. While it does take take a little planning since soaking is involved, the taste is completely worth it. After soaking the raw almonds in the refrigerator overnight (6-8 hours) or using a quick soak method of placing the almond in boiling water for 30 minutes to an hour. Strain and rinse the almonds, than place in a high speed blender with filtered water. I typically use 4 cups of water to 1 cup of almonds. This produces a milk with the similar consistency of 1% milk. For a creamier milk, simply use less water. After blending, pour the milk into nut milk bag (I use a flour sack towel) that is sitting in a large bowl. Holding the bag above the bowl, let the the milk drain and then gently twist the remaining milk out. What you are left with is the almond pulp. But DON'T THROW THIS AWAY! This can be added to muffins, oatmeal, smoothies, cookies, etc. You can make almond flour by placing it in a dehydrator or oven at 200F until completely dry (about 2-4 hours) and then blending it into a fine powder. Enjoy this delicious homemade almond milk however you please, I recommend serving it with my Walnut Fig Granola, Breakfast Muesli, or simply enjoying it fresh from the fridge! Place almonds in jar and cover with water. Let them soak in the fridge overnight (6-8 hours). Rinse and drain pre-soaked almonds in a strainer. Add the almonds to a high speed blender with 4 cups of water. Blend until combined (about 1 minute). 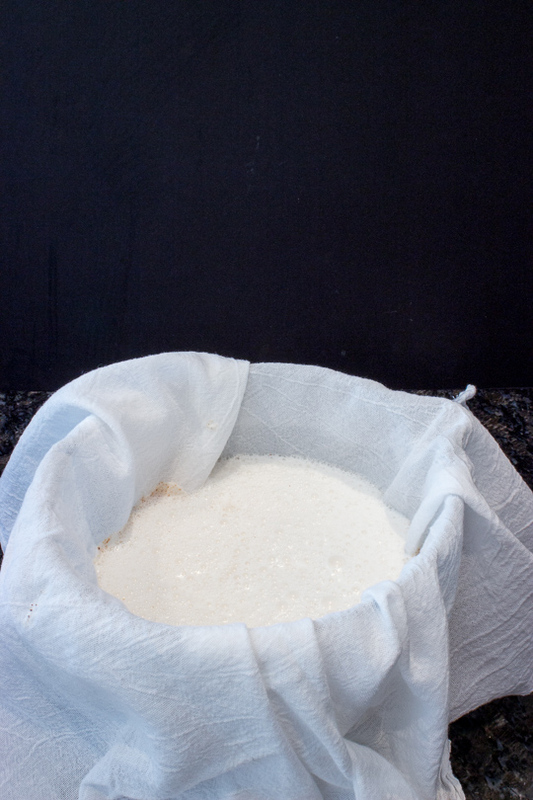 Place nut bag (or flour cloth) over a large bowl. Slowly pour the milk into the bag and tie the top. Holding the bag over the bowl, gently twist out the remaining liquid. Transfer the filtered almond milk into a glass jar or pitcher and place in the fridge for 3-5 days. Remember to shake or stir before drinking. Almond milk tends to separate, especially if peeled almonds are used. If you are adding dates, place them in the blender with the almonds. The other additions can be added after the milk has been filtered.